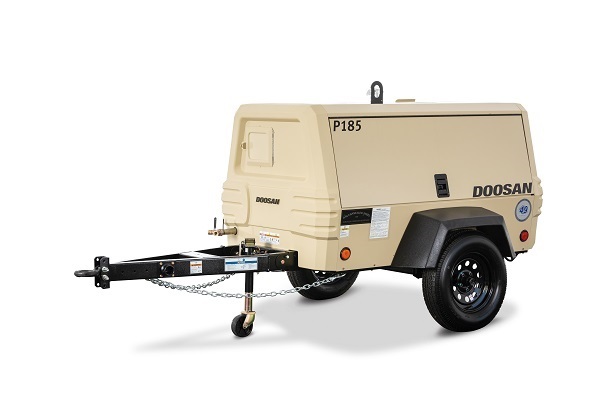 Doosan Portable Power has released a newly updated Doosan P185WDO portable air compressor featuring increased runtime and a proprietary Doosan airend as well as a Doosan engine. Doosan is the only air compressor manufacturer to use both proprietary engines and airends in its products. The P185 is equipped with a Tier 4 Final Doosan D24 engine and a Doosan DSN100 airend. Together, they deliver 185 cfm of air at a rated operating pressure of 100 psi. The unit runs 12 hours at 100 percent load, which is two hours longer than the previous P185 generation model, and two hours longer than its closest competitor. The P185 achieves longer runtime because of its industry-leading 34.5-gallon fuel tank. The high-performance Doosan engine provides the P185 with reliable power and improved cold starting capability in temperatures as low as -10 degrees Fahrenheit, which is 20 degrees colder than its closest competitor. Bringing both the engines and airends in-house in the new P185 has also simplified machine maintenance. The P185 has new, convenient curbside discharge valves and safer clean-out ports, with best-in-class cooler access. All filters are readily accessible and clearly marked, and the separated oil tank has a new fill and sight gauge. Diagnostic connections are also easier to reach while an LED backlit control display allows gauges to be read in almost any working condition. For storage, the P185 has the longest, deepest toolbox in the industry. The compact footprint provides easy towing and maneuverability while the galvanneal-steel enclosure withstands harsh jobsite conditions and resists rust and corrosion. The performance of the P185 is bolstered by multiple warranties, including a 1-year/2,000-hour bumper-to-bumper warranty; a 2-year/4,000-hour airend warranty; and a 5-year, 10,000-hour Doosan extended warranty contingent on the use of genuine Doosan fluids and filters and service at prescribed intervals.